Also known as: CAT5 USB KVM extender, remote keyboard mouse monitor, usb kvm extension 1000 feet long, kvm balun, kvm range extender. 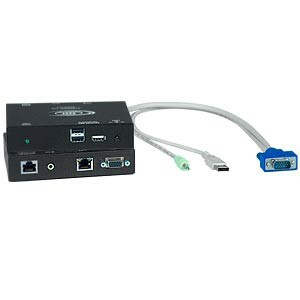 The XTENDEX® VGA USB KVM Extender provides local and remote KVM (USB keyboard, USB mouse and VGA monitor) access to a USB computer or NTI KVM switch up to 1,000 feet using CAT5/5e/6 UTP cable. Each ST-C5USBV-1000S consists of a local unit that connects to a computer and provides local keyboard, monitor and mouse connections, and a remote unit that connects to a keyboard, monitor and mouse. The local and remote units are interconnected via CAT5/5e/6 cable. Industry-leading ultra high resolutions up to 2048x1536. High quality, rugged steel construction with durable powdercoat finish. DDC2B emulation support for remote monitor. Available with optional stereo audio and/or additional USB 2.0 (low/full speed) port for local and remote user. For the additional USB port on the local unit, connect any type of USB device (fully transparent USB connection). For the additional USB port on the remote unit, use to connect a USB printer, touch screen monitor, interactive whiteboard, or CAC card reader. One male 15-pin HD connector. One male USB Type A connector. Audio option: one 3.5 mm stereo plug (audio in). Audio option: one 3.5 mm stereo plug (audio out). Available with an optional female USB Type A connector for an additional USB 2.0 (low/full speed) device. Connect any type of USB device – fully transparent USB connection. Supports resolutions up to 2048x1536; refer to the resolution chart below for resolutions at different lengths. Available with an optional female USB Type A connector for an additional USB 2.0 (low/full speed) device - USB printer, touch screen monitor, CAC card reader, interactive whiteboard, or barcode scanner. When using a USB printer connected from the remote unit, it is recommended to only print three pages at a time. Supported touch screen monitors: Microtouch 3M, Elo 1529L 3000 Series, Elo 1515L, Dell S2240T, Smart Podium ID422w, Hope Industrial HIS-RL17, NEC MultiSync E222W, Industrial Electronic Devices Inc IWS-240t-G3, Zytronics CML-170, Pulse IR TSV4001/DT40, HP Compaq, Sharp Aquos Board, Advantech FPM-2150, Touch Screens Inc TWAP-1150ADP/1154ADP-USB and similar monitors that use PenMount 5000/6000/9000 driver. Automatically adjusts the video quality and color skew to compensate for varying lengths of CAT5/5e/6 cable. Maximum delay: 62 ns in 2 ns steps. Manual fine adjustments are made via keyboard commands. Settings are automatically stored in the unit. The next time the unit is powered on, the adjustment will be recalled. Not an Ethernet device. Do not connect to an Ethernet device (card, router, switch, bridge). Permanent damage to the product or Ethernet device may result. How to extend a USB keyboard, USB mouse and VGA monitor up to 1,000 feet using the XTENDEX VGA USB KVM Extender. Signal-to-Noise Ratio (SNR): >76 dBA. Total Harmonic Distortion and Noise (THD+N): <0.1%. Additional USB 2.0 port for local and remote user. For the additional USB port on the remote unit, use to connect a USB printer, touch screen monitor, CAC card reader, interactive whiteboard, or barcode scanner. Supported touch screen monitors: Microtouch 3M, Elo 1529L 3000 Series, Elo 1515L, Smart Podium ID422w, Hope Industrial HIS-RL17, NEC MultiSync E222W, Industrial Electronic Devices Inc IWS-240t-G3, Zytronics CML-170, Pulse IR TSV4001/DT40 and HP Compaq. "The ST-C5USBVU-1000S units are working out very well. We're using them to extend KVM from our server racks to our On-Air Broadcast Studios, and running our automation system from the COMPAQ L2105 TM Touch screens. The On-Air Talent is loving them, because they don't have to move around the studio to make changes or ask a production assistant to get them information from another area."